You may – or may not – know that our river, canal and stream sides are vulnerable to a pernicious foreign invader which, once established, progresses to overwhelm virtually all other vegetation, eliminating the biodiversity of such settings. 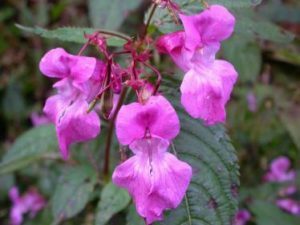 It goes by the name of Himalayan Balsam and is in, and around, Hayfield, Birch Vale and Little Hayfield. Several members of Sustainable Hayfield have been having a go at uprooting the plant, as they have been encouraged to do by English Nature, the Wildlife Trusts and other reputable bodies. But they need more people to be aware of the plant and take action where they (that’s you!) can. Sustainable Hayfield supporter Sue Wyatt has put together this poster to advertise the threat and advise what needs to be done. For all its height – it can grow up to 2 metres tall – it really is very simple to uproot and break its stem, requiring little strength: children can do it. But the time to do it is now! So, if you see some close to home or at a favoured place, please spend a few minutes yanking it out and save us all more problems down the line.